I recently purchased the newly released Sony a7iii as a long overdue upgrade to my Sony a6000. My a6000 setup had included a Zeiss 24mm f1.8 E-mount APSC lens. This lens is particularly useful when I need to photograph food that I hold in the air myself. Naturally, I would need an equivalent lens for my a7iii. 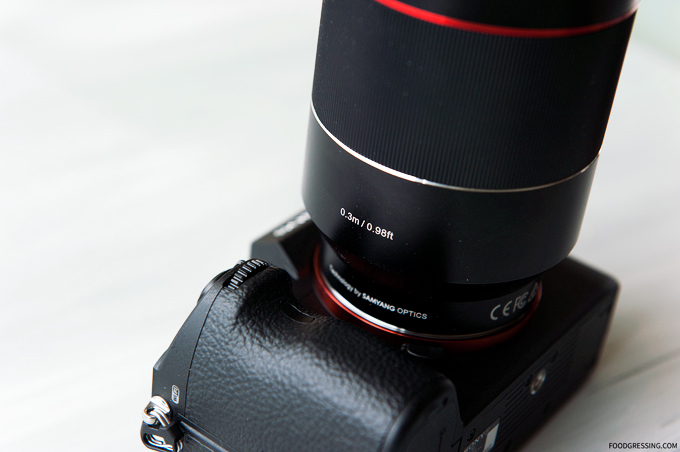 Based on reviews comparing Rokinon versus Zeiss 35mm f1.4, Rokinon received favourable responses. 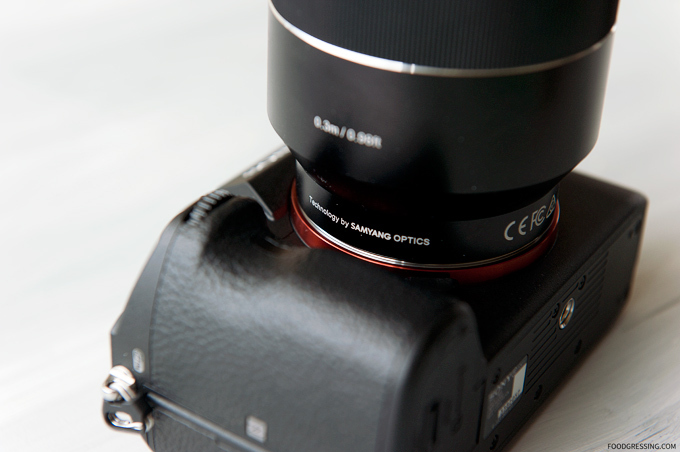 Furthermore, the Rokinon was priced favourably at less than half the price of the Zeiss. I managed to score an extra $100 off for the Rokinon when there was a sale; it was $800 at the time of purchase. I ordered the lens directly from Amazon.ca. The lens was shipped from Kentucky and took 4 days to arrive. 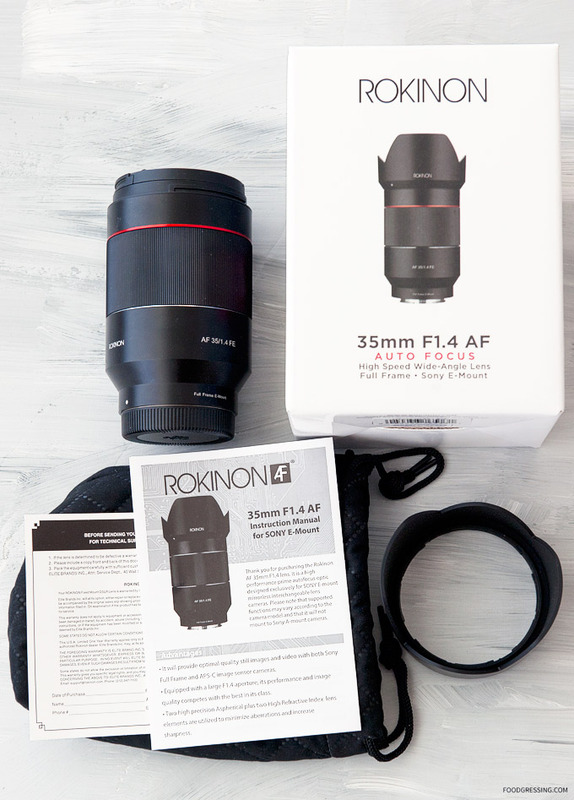 Here’s a look at a brief unboxing video of the Rokinon 35mm f1.4 which included a lens hood, lens caps, lens pouch, instruction manual and warranty. Upon taking the lens out of its box, I immediately noticed its hefty weight. This is a good sign that the lens is made with a significant amount of glass and metal. You can’t always equate weight to build quality, but I definitely felt that it was well made. 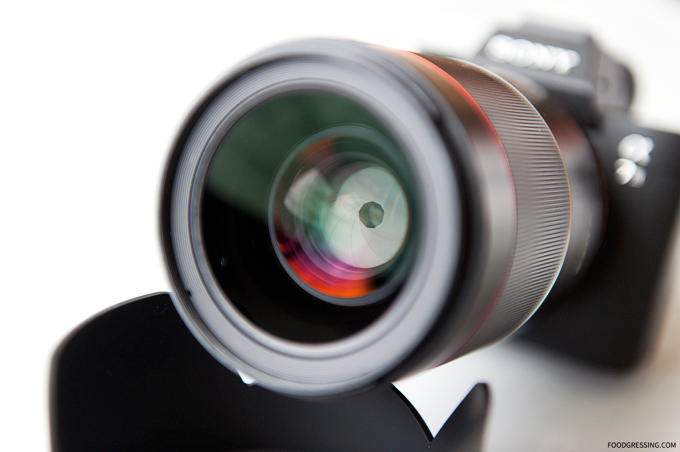 During my initial handling of the lens, I was unable to fully lock the hood on to the lens. I went back to it at a later time and discovered that I had to twist the hood with much greater force before it finally clicked in. Nothing is wrong with it; it was just something new that I had to get used to. 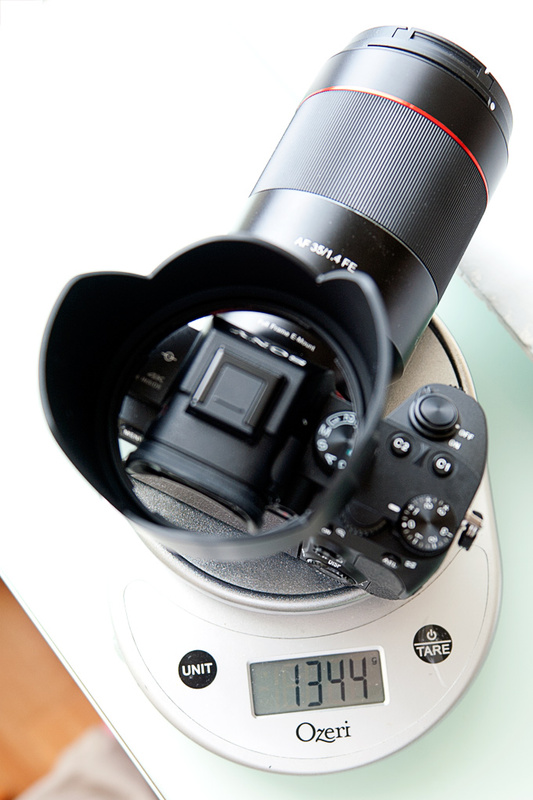 One of the major selling points of mirrorless systems was the size and weight savings compared to traditional DSLRs. I have benefited greatly from this in the past couple years of owning the a6000. However, with a full frame body and f1.4 lens, the size and weight advantage quickly reduced. The Sony a6000 with Zeiss 24mm f1.8 weighs in at just over 600g. My new setup, the Sony a7iii with Rokinon 35mm f1.4, weighs more than double at 1344g. So far, I’m happy with the purchase. The pictures taken with my new setup are certainly more tack sharp than my previous setup. While I am very happy with my new Rokinon lens, it is not perfect. The nitpicky part of me noticed that the shape formed by the 9 aperture blades is far from regular, and this problem is less apparent at f8. This is certainly no deal breaker for me as I will generally not use this lens with aperture setting below f5.6. In general, I am satisfied with Rokinon 35mm f1.4 based on photo quality and pricing. I would recommend the purchase to others as a cheaper alternative to the Zeiss. Check it out on Amazon.com or Amazon.ca.